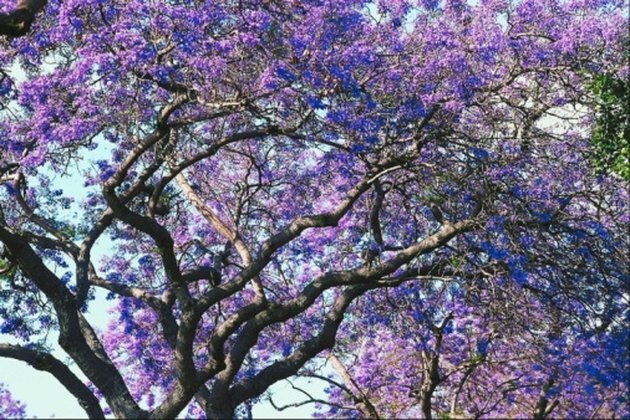 The empress tree (Paulonia tomentosa), also called the princess tree or paulownia, is originally from China and Korea. This deciduous, fast-growing ornamental thrives in U.S. Department of Agriculture Plant Hardiness Map zones 7 and above. The empress tree can grow up to 100 feet tall, with leaves that can grow up to 12 inches long. It produces abundant clusters of purple or lilac tubular flowers in the spring before the leaves appear. The seed capsules mature in the autumn and contain up to 2,000 small, winged seeds. Place the empress tree seeds in the refrigerator for two weeks at a temperature of 39 degrees Fahrenheit. This speeds up germination. You can store these seeds for up to a year in the refrigerator. Sow empress tree seeds thinly in a pot containing moist standard potting compost. The seeds require light exposure to germinate and will remain dormant if they are buried. Place the pot in a sunny location outdoors and keep the soil moist at all times. The seeds will germinate within 10 to 30 days at a temperature of 65 degrees Fahrenheit. Keep the seedlings in bright sunlight as they develop. Repot them into individual pots as soon as they are large enough to handle. Fertilize repotted seedlings with liquid fertilizer diluted to half the recommended strength. Harden off empress tree seedlings outdoors once they are eight to 12 weeks old. Use a sheltered, frost-free spot. Plant the empress tree seedlings on bare soil with no shade, preferably on a south-facing slope. Leave at least 4 feet between seedlings so that the growing plants do not shade each other. The seedlings will grow slowly during the first year, as all their energy goes into root development. Alex Bramwell started writing in 2002 and spent six years in the field of writing and editing news reports in the business, finance and technology sectors. He is the author of several guidebook chapters and the complete "Sunshine Guide" guidebook to Gran Canaria. Bramwell holds a Bachelor of Science with honors in zoology from the British University of Reading.